I am super excited to announce this fabulous giveaway from the team at Edge of Belgravia. One lucky reader of Sandhya’s Kitchen will get a chance to win a Black Diamond knife block (£99.90) and Complete Precision Chef knife Series (£69.90) across UK, US and Australia. Isn’t it the perfect Christmas gift this year? Established in Belgravia, London in 2010, this firm is one of the world’s boldest and most innovative knife brands for chefs, offering combination of contemporary design with high tech materials and supremely sharp stainless steel. Their aim is to design a tool that gives your kitchen a cutting edge as well as a useful gadget. 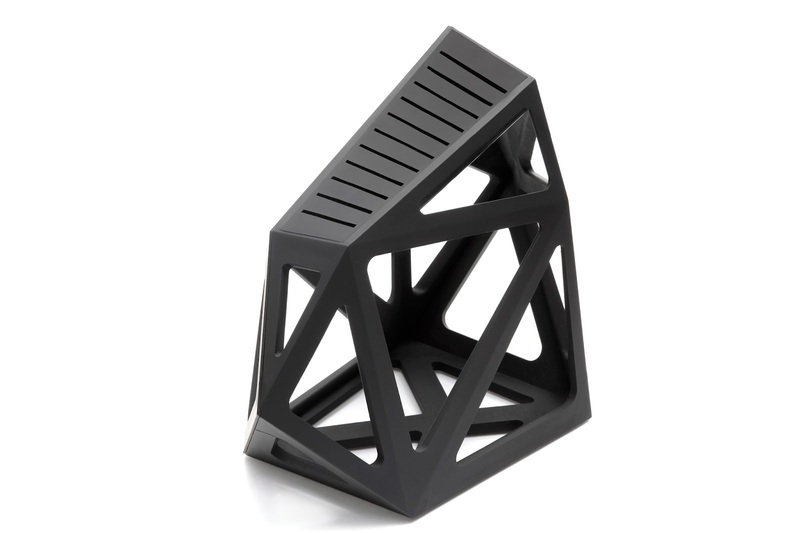 Black Diamond Knife Block, is designed to look futuristic with the angles of a rough cut diamond while its architectural quality reflects the finely angled handles of our signature range of chef knives. Designed for maximum flexibility, Black Diamond is suitable for most knives – as long as the blade is thinner than four millimetres. Tightly packed, it can fit up to 11 knives but will appear a complete unit with just two. The complete set of Precision Chef Knife Series features four knives – bread, chef’s, paring and deba knife. Precision manifests the combination of bold design and the superb cutting capability of the stainless steel blade. It represents just as much an effective cooking tool as a piece of art. Edge of Belgravia Precision Chef’s knife is the knife of choice for John Williams (executive chef, The Ritz Restaurant) and James McIntosh ( Winner, World Cookbook Award) . To be in with a chance of winning this knife block and precision knives set, all you have to do is enter via the rafflecopter form below. You can even win extra entries by tweeting and sharing some of my recipes each day. This giveaway is open to UK,US and Australia entrants only and runs until Tuesday, December 15th. PS: I was sent a complete set of Precision Knife Set and Black Diamond Knife Block as a compensation. I would like to gift my parents. Very prefect chef knifes to gift a home maker.. Wish to have them to decorate my kitchen..
Great prize. Great looking knives. For myself, my knives are years and years old, could really do with some new ones. I'd love to win this for my other half so he can practise his cooking! I'd like to win this for myself. I could do with a new set of knives. I would like to win for my mum as hers are rubbish. For me as I desperately need new knives. I would love to win a decent set of knives, as I do all the food prep and cooking in our house. For myself! I desperately need a new set of knives. It's my turn this year to cook my family Christmas dinner. my brother as he is buying his first house in the new year. Would love to win as a Christmas gift to …myself! 🙂 They look great..thanks for chance. Because all my knives are old, blunt and useless! we love cooking but don't have any awesome knives, this would be fab!! Great giveaway, i need a new knife set, mine is half missing. this would be for me as my knife set is nearly 10 years old and was one of the cheapest from argos. I think its about time to get a new set. I'd give them to my son whose a good cook but has just ledt home and all my Utensils !! I'd love to win these for my mum as her and my dad';s knife set is now around 10 years old and these would look perfect in their new kitchen! I would love this knife set for myself – would be so great! I would love to win it for myself, I need a new knife block. My brother who is a chef as he'd appreciate them. For myself, my knives are a mixed batch and need replacing. I'd like them for me as my old knives are not so effective. I want to win this for my boyfriend's step father because he needs a new set of knives. Thank you so much for the opportunity! The kitchen knife set seems to be an essential kitchen accessory which need to be added to your modular kitchen. Without these you can't imagine to work in your kitchen. I would love to win these for my kitchen as all my knives are old and don't match. I'd love to have these knives in my new kitchen, I've waited 10 years for it !! I would love this block of knives, my own are so old the handles are falling off and I really want to try out some new recipes for my new heathy lifestyle I'm trying to create! I would like to win this for my husband and myself. He loves cooking, I don't, but we can never find a sharp knife! I can't stand cutting up tomatoes with my blunt knives – they squish everywhere! I want new knives to avoid this! For myself. I bought the Taylors Eyewitness Knifes and they are awful! I would like to win for my partner, he is always moaning about our knives. My knives have seen better days, I would love to win a decent new set. I would love to win this for my mother-in-law to be as she is a brilliant cook in the kitchen but uses utensils that have seen better days. I know she would really love these. I would love to win it as a gift for my son who has his own home now and is a budding cook – in fact he's already better than me with a lot of things – but doesn't have much kit yet. Would love to win these for myself as my knives are USELESS and I'm forever firing bits of food about the kitchen! For me, the knives in my kitchen are the same ones my mum had when I was young, would be nice to have new ones rather than 20+ year old ones! I would like to win these for myself. They will make me look like a real Chef in my kitchen. Love to win for myself. Love to some new knifes to replace the one I both 16 years ago. id love to win for my boyfriend. hes been complaining about ours for quite a while so he'd love them! For my Mum and Dad's kitchen, because they need some new knives. I would like to win these knives for my husband because his knife skills are non too sharp at the moment! Bless. Gosh these look amazing! I would like to replace my old blunt knives. I'd love to win these because they look really good and I could do with some new knifes. what a unique set of knives. Would love them for me and my family to get us cooking more from scratch. My son does a lot of cooking and is always complaining about the quality of our knives,I would love to win them for him. My son will be heading off to Uni next year. He likes to cook so these super funky knives would be really useful. My mother in law, she's asked for a knife set for Christmas this year, perhaps i'll run before she has a chance to open the box!! I would like to win for my son and his partner. They haven’t long been in their house together and every kitchen needs a good set of knives. I could never afford quality knifes. Would love to be able to prepare my Xmas dishes. Count me in please. My husband, he loves cooking and all our knives have seen better days. I’d gift it to my brother who is a very keen cook. My wife would love this as a Christmas present. For my girlfriend as she’s always complaining about how blunt our knives are! I would give this to my husband as his main christmas present. He is the chef in our house and loves new flashy tools! Can they cut an apple in half mid-air? I would love to win for my sister-it would make a fab gift for her-she is the cook in the family! I would love to win this for myself to brighten up my kitchen. Would love to win for myself. Love the style of the knife block and it will look good in my kitchen. I do all the cooking in our house and so it would be nice to own a decent set of knives. myself firstly as mine are blunt and secondly these look great!! For myself, my knives are all years old and desperately need replacing. For my partner and I. We’ve never had a knife block and the cheap knives we have never seem to sharpen up no matter how much we try. My partner as he is cooking for xmas this year and is always complaining about our knives! My hubby would love these.. he is the chef in our house. I would love to win his gorgeous knife set for my husband who is a keen cook. We Cook together as a family on weekends and would proudly use this great quality product. If I won they would be for me and the husband. Are knife set is useless so would love something better. I’d like to win this knife for me, it will be a great help in chopping up all the fruit and veggies I will be eating come the new year when I am determined to lose weight and get myself healthy!!! I would love to win it for myself, I haven’t got one decent Knife in my house…. YET! My parents I get so frustrated when I cook at their house and they dont have a good knife! My daughter because she has borrowed two of my favourite knives and I want them back! For myself, my knives are so blunt! My knives are old and blunt! For me, as I don’t have a single decent knife in the house! My husband as he has done years of carving the Christmas dinner with a blunt knife! I would love to win this for my other half as he loves to cook but we don’t have the best knives for him to practice with. I would like to win the knife set for my husband. I work as a cook, and he cooks for me all over the weekend, so some good quality knifes would be great for him . It would be a nice housewarming gift for my brother in law. I would love to win it for myself, we have no decent knives! Mum because her knife block is very old ! For me, as it is something I always mean to buy then put off and make do. It would be lovely to have sharp quality knives. For my brother, he’s finally moved into his own place! I have somehow lost my bread knife and two others in my set are on the wonk due to the cooking ‘skills’ of my bf! Would appreciate something with a little more quality! For me – all of my knives are blunt! I would like to win it for myself! I cook everything from scratch due to family allergies so anything which would help me is fantastic – my husband might even do more of the chopping if we had these knives! I would love to win for my mother in law living in Australia as they don’t have them there. I dont have any decent knives, so they would be for me. I would love to give these to my sister and her husband. It would be a lovely gift. For my husband as he does all the cooking in our house and I mean all, I don’t even make my own toast. He is such a keen cook, these would make him so happy. For the hubby and because most of our knives are on their last legs! Definitely myself, just moved house and could really do with a new set. It’d be a housewarming gift for my mother – she’s just moved house by herself and I think this would be a great gift for her! It would make the perfect gift for my partner who is the chef in our house! Would be wonderful to replace our blunting knives! For me, our knives are old & rubbish! For myself, for my new kitchen. I would love to win these for my partner, who is also my carer. He does most of my cooking for me as I can’t manage myself due to having Multiple Sclerosis and Rheumatoid Arthritis. He cooks me some lovely meals and this would be a lovely treat for him to show him my appreciation! Look nice for the wife as she makes lots of stews. My current knives are very dull and we’ve wanted to replace them for ages!